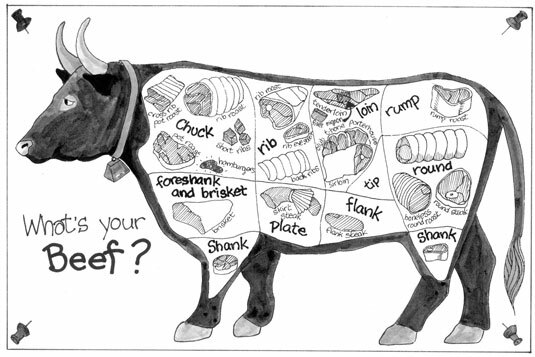 When buying beef, consider its grading and cut. Also, buy beef with good marbling (flecks of fat) — the more marbling there is, the more moist and tender the beef will be. Beef is graded according to the animal’s age, the amount of marbling in the cut, and the beef’s color and texture. Prime: The highest grade and the most expensive. In general, the most tender and flavorful beef falls under this category. Most beef from this grade end up at hotels and fancy restaurants. You can also find it at specialty butcher shops. Choice: The second tier of beef grading, leaner than prime. This is what you’ll find most often at the supermarket. Select: Best for stewing and braising. You’ll find this in supermarkets. You might also see grades of beef labeled Standard and, less often, Commercial. These two grades lack marbling (you have to chew a lot) and are of low quality. Edible? Certainly. Enjoyable? That’s up to you! The more tender cuts of beef include steaks such as porterhouse, sirloin, shell, New York strip, Delmonico, and filet mignon — as well as roasts such as rib, rib eye, and tenderloin. Tender meats are usually cooked by the dry heat methods of roasting, broiling, grilling, and sautéing. You usually cook less tender cuts that have more muscle tissue and less fat by braising and stewing. Tougher cuts include brisket, chuck, shoulder, rump, and bottom round. Look beyond ratings to judge meat. Meat should look bright red, never dull or gray. Excess juice in the package may indicate that the meat has been previously frozen and thawed — don’t purchase it.